Jennifer Lawrence taking a tumble at the Oscars in 2013. PHOTO: Giphy.com All poor J-Law wanted to do was collect her Best Actress award with a little grace and dignity. But it just wasn't meant to be. 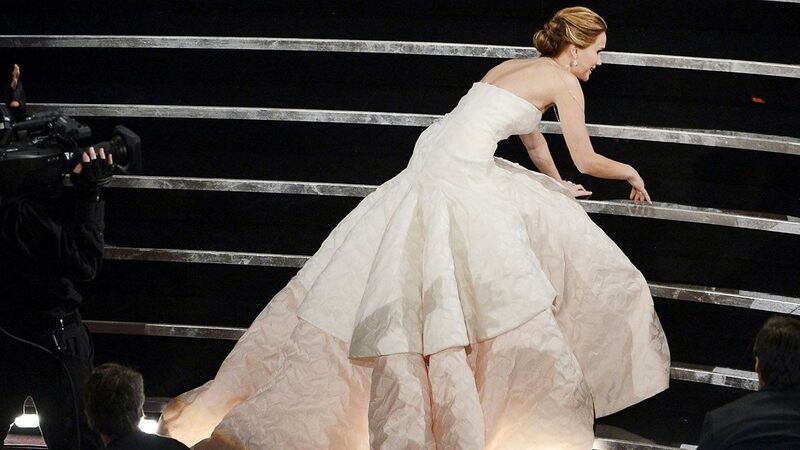 Jennifer Lawrence taking a tumble (AGAIN) at the Oscars in 2014. Nicole Kidman being unable to locate her husband Keith Urban's lips at the Golden Globes in 2018. They just couldn't get themselves lined up for some reason. Emma Stone's awkward three-way hug at the Golden Globes in 2017. After La La Land director Damien Chazelle won best screenplay for La La Land, Ryan Gosling went in for a hug with him, and then lead actress Emma thought it was her turn. Only, er, the director reached for girlfriend Olivia Hamilton instead. Cue Emma responding the way we all would: "That was weird." Hugh Laurie left Tom Hiddleston hanging at the Golden Globes 2017. When Hugh Laurie won best supporting actor for The Night Manager, Tom was left hanging when he didn't see his extending hand. Oops. Leonardo DiCaprio's weird fist-bump/high-five nightmare at the Golden Globes 2016. You know when you're live on TV, being broadcast to millions around the world and you try to fist bump someone who's going in for a high-five, so they sort of caress your fist in their palm like a sexual game of Rock, Paper, Scissors being played between two grown men? Umm, yeah… that. Leonardo DiCaprio getting shoved out the way by Lady Gaga at the Golden Globes in 2016. Leo's reaction to getting bashed out the way by Lady Gaga as she goes to collect her award is probably the greatest thing that's ever happened. Like ever. James Franco refusing to let Tommy Wiseau speak at the Golden Globes in 2018. Everyone just wanted The Room star to say, "Oh, hi Mark," and he was denied. Madonna falling over at the BRITs in 2015. Madge got caught in her cape and hit the deck so, so, so incredibly hard that the whole of Britain gasped in unison. That dancer probably never worked again. John Travolta getting Idina Menzel's name incredibly wrong at the Oscars in 2014. Seriously… how did that even happen? John Travolta being astronomically weird with Scarlet Johansson at the Oscars in 2015. We're pretty sure that's not how you're supposed to behave on the Oscars red carpet. Kanye West interrupting Taylor Swift's acceptance speech at the VMAs in 2009. Poor ol' Taylor was so excited to accept her award for Best Video for her track "You Belong With Me." Until Kanye turned up and declared that Beyonce should have won instead, that is. Rashida Jones getting a lovely compliment on her "tan" at the SAGs in 2015. Michael Fassbender and Alicia Vikander refusing to take part in the kiss cam at the BAFTAs in 2015. The couple were keeping it quiet about whether they were actually together or not when this happened. So that was nice and awkward for them. Every single thing that happened while James Franco and Anne Hathaway hosted the Oscars in 2011. It was all so, so bad.